A Prince Charles speech at Georgetown University in Washington saw the Prince of Wales return to familiar public speaking territory. His keynote speech at The Washington Post Live event, The Future of Food, was an enthusiastic return to a subject that has occupied his attention for nearly 30 years. 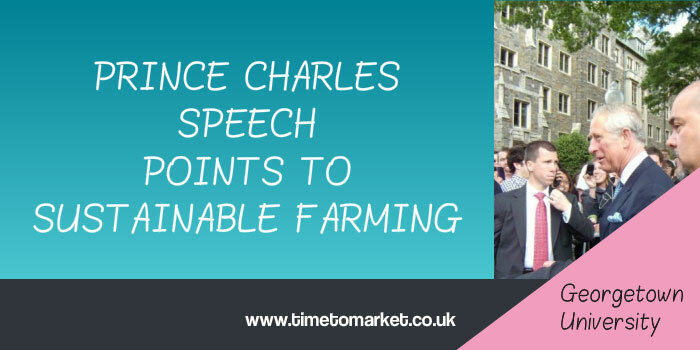 His passion for sustainable farming, food production and animal husbandry is evident in his speech. These are matters that he’s deeply concerned with. And his passion for the subject made for an energetic speech. His speech to students and members of faculty was a major feature of his three day visit to Washington D.C.
His introduction involved both a definition of the word, sustainable, and also a reference to his thirty year involvement in the subject. A classic start for a Prince Charles speech. He managed also to reference his speech at the wedding of Prince William and Catherine Middleton last month. That was topical and appreciated by his audience. …how can we create a more sustainable approach to agriculture while recognising those wider and important social and economic parameters–one that is capable of feeding the world with a global population rapidly heading for nine billion? Other questions followed and he aimed to suggest answers for them. He used figures and statistics with ease. Certainly the source or attribution of the data was never an issue for him…and that might have been a problem with another speaker. We had a sense of the data sources towards the end of his speech when he began to reference the United Nations. One particularly powerful moment in his speech was his outline of the food equation. An equation that involves people starving in one part of the world and others with obesity in another. In one way or another, half the world finds itself on the wrong side of the food equation. A very neatly put-together image. A clever conclusion to this Prince Charles speech at Georgetown University. For more public speaking tips and suggestions aimed to get you ready for your next conference speech you can always consider a day’s public speaking coaching with Time to Market.